It seems like every time I turn around, dealerships are trying something different to attract attention. Honestly, I think it’s a good thing. Mixing it up keeps the environment new and fresh. Not to mention, nobody wants to see a 100 year old banner that has faded through age and use. One less common item that can be utilized particularly well are large vehicle bows. These bows are large, attention grabbing, and work especially well when themed or timed with special events. The upcoming holiday season is an excellent time to have some bows like these around. 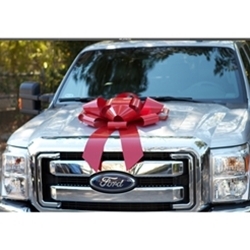 Car and truck bows can be found in a wide selection of different durable materials. Additionally, many dealership suppliers offer magnetic car bows, so as to guarantee that the bow stays in place. This will ensure a lasting effect. If you are interested, be sure to browse our selection or contact our friendly sales team. Thanks for reading!